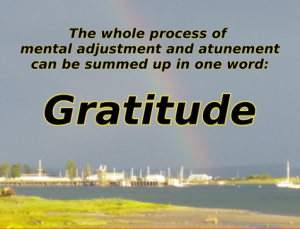 What is an Attitude Adjustment? I can remember as a child listening to my dad shouting “where is that attitude adjuster!” He was referring to a hammer. 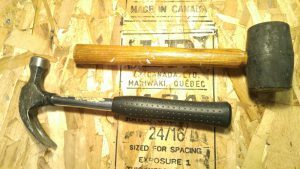 It did not matter whether it was a big sledge hammer or an ordinary claw hammer, it would adjust the attitude of whatever it was my dad was working on at the time. That is one way to adjust a physical object that is stuck in an unwanted position. But how do you adjust ones mental attitude that is just as stuck? One of my mentors, Bob Proctor, would often quote from The Science of Getting Rich by Wallace Wattles. Just being grateful, and expressing that gratitude, is how you can adjust your own attitude. And gratitude is not just for the pleasant things. There is good reason to be grateful even in an unpleasant situation. All things — whether they may be pleasant at the time or not. There are some simple ways to adjust your attitude that are easy to do. One way is to simply go for a walk. Going for a walk is often therapeutic by itself, but by being very deliberate during the walk to say out loud, “I am grateful” raises the experience to another level. For me, when I do this, I will look around at the grass (or the snow), the trees, the birds, the sunshine (or the stars), the sidewalk, and express my gratitude for the things that I see and hear around me. If the weather is not so pleasant to go for a walk, another way to make the mental adjustment is to stand in front of a mirror. As you do so, you may want to itemize some things you are grateful for such as; good health, a place to live, clothes to wear, food to eat, or whatever else is important in your life. One final way to adjust your attitude is to take pen and paper and write it down. Start with writing, “I am happy, I am grateful” then write out one thing you are grateful for. Then write it again, “I am happy, I am grateful” and write out another thing that you are grateful for. Then do it again and again. There are times when all I have written is, “I am happy, I am grateful” over and over again. There are other times when I just write out a list of things I am grateful for. There is a song I used to sing in church that included the line “count your blessings, name them one by one.” That is what this is all about — counting your blessings, consciously and deliberately expressing gratitude for the many good things you have in your life. Find your way to express gratitude, to be grateful, and truly your attitude will be adjusted! Just think, and please comment below, about how your own attitude has adjusted just by reading this article? I’m happy and greatful for all the people, family and friends, in my life. those are truly wonderful people to be grateful for!